sentiments than with a white dove release before or after your wedding ceremony. Doves mate for life and symbolize love, peace, unity, fidelity and remembrance. good fortune, and ever-lasting love. will awe your guests and turn your wedding into a day no one will ever forget. 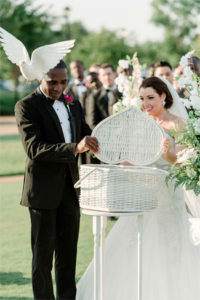 In addition, doves can be on display in a decorative cage for all guests to view before the release.